Keeping children and young people safe online is one of the biggest challenges facing society today and it is all of our responsibility to ensure that children are educated to make positive, informed choices when they are online. Our staff are experienced and passionate in engaging and communicating online safety messages to children, staff & the wider school community. We want to work with schools to promote the positive use of technology to make the online world a better and safer place for us all. Here are some examples of the services we offer to schools to help them deliver online safety in their school. A monthly online safety newsletter personalised with your school name/logo to send to parents. Click one of the links to view a previous edition of our Online Safety Newsletter – Primary or Secondary. A full staff training session at your school covering the latest policy guidance from DfE/Ofsted and ideas for curriculum delivery. The session can be delivered as a twilight session or as part of an Inset day. 2 places for teaching, non teaching staff and Governors at our annual Online Safety Conference. We include speakers from external organisations who are experts in their field. We will provide you with an auditing tool that will allow you to complete an online staff skills audit. Once completed the data will be collated, analysed and returned to you with recommendations. We host 3 training sessions during the year which you can send two members of staff and/or Governors to. Topics have included Delivering Online Safety in the Classroom and Preparing for SID. Advice and guidance on the latest guidance relating to online safety and online bullying. Access to our Online Life classroom resources, produced by us to meet the requirements of the UKCCIS Connected World Framework (available here). Our SOW is available for years 1-6. We will provide you with content, links and other resources that you can publish on your school website. This content will be aimed at both children and parents. Following on from a report from the UK Council for Internet Safety which highlighted the challenge schools face in engaging the community in Online Safety matters, we have introduced a new package, a monthly online safety newsletter personalised with your school name/logo to send to parents. The annual subscription includes 11 monthly newsletters (excludes August, subscription can start at any point through the year) for a total of £120 +VAT per year. 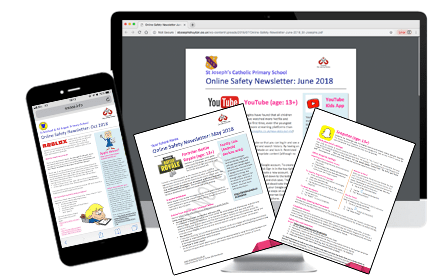 Click one of the links to view a previous edition of our Online Safety Newsletter – Primary or Secondary. We offer discounts for multi trust academies and groups of local authority schools that all wish to subscribe at the same time or for ‘small’ schools so please do get in touch if you would like further information on our pricing structure. The UK Council for Internet Safety recently published its Education for a Connected World Framework (available here). This sets out the expectations for schools in their delivery of online safety. We have produced an Online Safety resource to allow schools to meet the requirements of the framework. 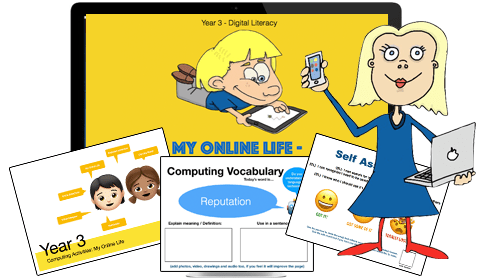 The Online Life resource is available for Years 1-6 and consists of teacher guidance notes, a teacher handbook (presentation) and for years 3-6 a children’s book which the children complete as they learn each element of the skills. For each year we have combined the latest video content, points for wider class discussion and relevant tasks that allow the children to consider their online behaviours. For an additional charge we can also provide a session for the Governing Body. Strategic Support – we can support schools in developing a strategy for Online Safety. This will include looking at all elements of Online Safety including planning, policy, infrastructure & classroom delivery. This can also include support for schools who are undertaking the 360⁰ eSafety Award. Online Safety Staff CPD – Our staff CPD sessions aim to ensure that staff are kept up to date with the latest eSafety policy/ legislation/ Ofsted requirements and to provide them with practical suggestions for integrating Online Safety into curriculum delivery. Sessions range from £100 for a twilight session to £250 for an all day session.